This large family chalet, very comfortable, is located in front of Mont Blanc, on the Saint Gervais-Megève-Saint Nicolas de Véroce ski area. 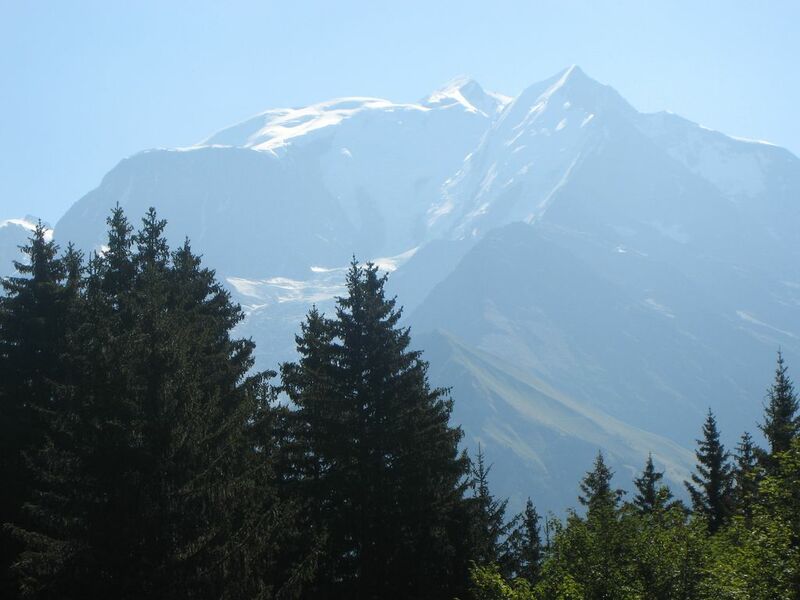 The view of the whole chain of the Mont Blanc massif is exceptional. It enjoys a quadruple exposure and is particularly sunny. To be precise, it is an old typical altitude restaurant, bordering a green slope that leads to the whole resort. Ideal for snowshoeing and hiking trips in a beautiful and soothing. Ideal for children who can toboggan safely at the closing of the slopes. Ideal for those who want to rest in a rare environment. As soon as the slopes are closed, calm is absolute, there is no construction in sight. Located in the heart of the resort, the chalet is not directly accessible by car in winter because the summer road is snow-covered. To access it, it is best to take the cable cars or chairlifts to the Bettex and ski down, in 5 minutes, on a green slope to the chalet. On foot, snowshoeing or ski touring you can walk up from the resort for 25 minutes on a well-groomed track or along a marked path along the track. For the arrival, we advise you to ski with as much as possible backpacks. However, you will not have to take the car to go skiing, refueling or driving the children to class. You put your skis on the terrace of the chalet and go down in 3 minutes the track until the Bettex. There is also a very elaborate mountain bike course. Swimming pool, tennis, golf nearby. You will get there then in 4X4 vehicle preferably by a paved road. - on the ground floor, large living room of 40m ² overlooking a terrace of 60m ², kitchen dining room of 15m ², SAS entrance, bathroom, toilet, shower. 1 large room with 2 beds 90 and 1 cot. Bathroom with bath, shower, sink and toilet. - in the basement, laundry and storage. It is therefore suitable for 9 people. We have kept the old restaurant bar and all have a certain cachet of the region. There is all the usual household appliances (washing machines and dishes, clothes dryer, fridge-freezer, ..) and also fondue and squeegee appliances. The chalet is equipped for small children (folding bed, high chair, toys) and for older children (sledges, board games, books). The stores for refueling are at the bottom of the green slope. You will find good local products at very affordable prices and in addition to friendly advice to make your fondue a success! After the small organizational effort required for the arrival (in winter), the stay is particularly relaxing, invigorating and exotic. We ask you to call us on 06 16 66 17 05 before any commitment on your part to ensure that this chalet meets all your needs and give you details and advice for your stay. Vacances idéales pour les sportifs qui acceptent de monter les bagages et les provisions en arrivant, mais la récompense est totale les jours suivant, départ à ski du chalet et retour direct sur la terrasse. Le chalet est confortable et simple. Magnifique chalet littéralement situé sur les pistes, le "charmant" a su nous apporter tout ce que nous attendons de notre séjour hivernal: confort, calme le tout skis aux pieds avec un accès direct aux pistes et remontées mécaniques. Le plaisir d'être les premiers à faire une trace dans la neige fraichement damée. Mais il faut le mériter ... Adeptes des formules "all inclused" s'abstenir... Nous y sommes allés, retournés et nous y retournerons. Ski: Located on the slopes of Megève and Saint-Gervais-Saint Nicolas de Veroce. Evasion Mont Blanc pass nearly 300 kms of tracks. locations l'été à partir du 15 mai jusqu'au 11 Novembre selon enneigement (route d'été accès 4x4) location l'hiver à partir du 1er décembre jusqu'au 12 avril environ tarifs selon la période versement 50% lors de la réservation le solde à l'arrivée les charges sont comprises (chauffage et autres) Prix exceptionnel cette année du 2 au 15 février (la semaine du 9 au 16 février étant une semaine de vacances scolaires).